I pulled out the big guns for October in the Pretty Hungry 2015 Recipe Calendar for obvious reasons. (Because October is the best month there is. Duh.) This is the recipe I was most excited about in the whole calendar… which is saying something since this granola is pretty to-die-for. But this one was my baby. I love everything about it. How it tastes, how it looks, how it makes me feel cozy and Fall-ish (and even a little bit virtuous.) And I especially love how many of YOU have been raving about it as you cook through this year’s calendar. Your feedback is always fun, and it has delighted me to hear that YOU AGREE! This recipe IS the best! 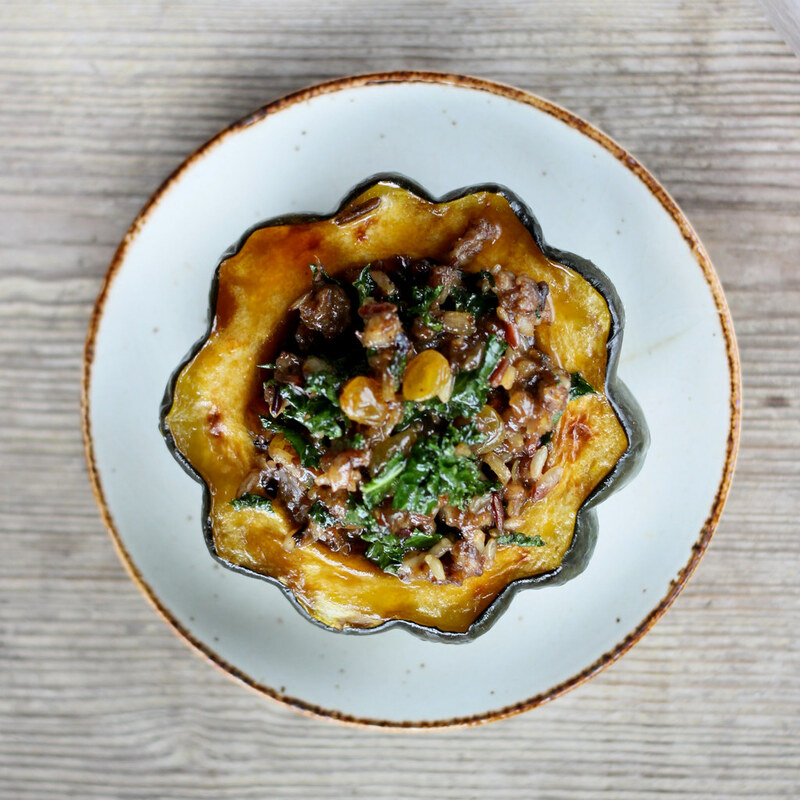 Yay for squash and yay for October! (By the way, I’m painfully aware that I did not get this “October-themed” post published until November. We could blame my packed schedule for that… but instead I’m calling it a toootally-planned, special, “early release” recipe, exclusively for calendar owners.) And now it’s everyone else’s turn to see what all the fuss is about! So let me give you a brief overview of the sensational tastes gathered together in this dish. Acorn squash smeared with butter and brown sugar, roasted in a hot oven til it just begins to char, and sprinkled with a hint of sea salt. (Heavenly, all on its own, amiright?) But then we’ve piled in a generous stuffing of sausage, onion, wild rice, balsamic, more brown sugar, golden raisins, kale, and other such magesty. If you’re not drooling yet… are you human? And though October may be over, squash season is still in full bloom for several more weeks. This is THE meal to pull out for company this month. Perfect for meat-lovers and veggie-lovers alike. Plus, SO festive! Need I gush on? 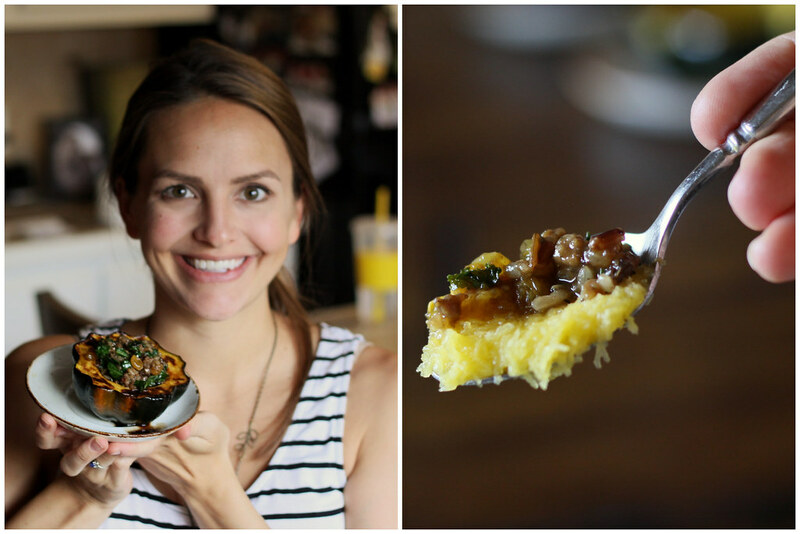 Butter-roasted acorn squash stuffed with brown sugar, balsamic, wild rice, & sausage stuffing. Carefully slice each squash in half, scoop out the seeds, and spread flesh with softened butter. Sprinkle buttered squash halves lightly with sea salt, then with 3 Tbsp. brown sugar. Place squash, skin-side-down, in a glass dish and add ½ inch of water to the dish. Bake at 375 for 50-55 minutes, until squash begin to brown nicely. Meanwhile, cook wild rice according to package instructions and set aside. In a medium frying pan, brown sausage, then use a slotted spoon to set meat aside in a bowl, leaving sausage fat in the pan. Add chopped onion to sausage fat in pan, sprinkle with ¼ tsp. sea salt, and allow onion to caramelize over medium heat for 8-10 minutes. Add minced garlic and stir together with the onion, allowing garlic to cook for 1 minute. Add the sausage back to the pan. Then sprinkle in the sage, pepper, another ¼ tsp salt, and the flour evenly, stirring to combine. After about 1 minute, stir in the water and golden raisins and allow mixture to bubble and thicken for 1 minute. Then turn off the heat and stir in the chopped kale, wild rice, balsamic vinegar, remaining brown sugar, and remaining ¼ tsp. salt. Taste and add additional pinches of salt and pepper if needed. 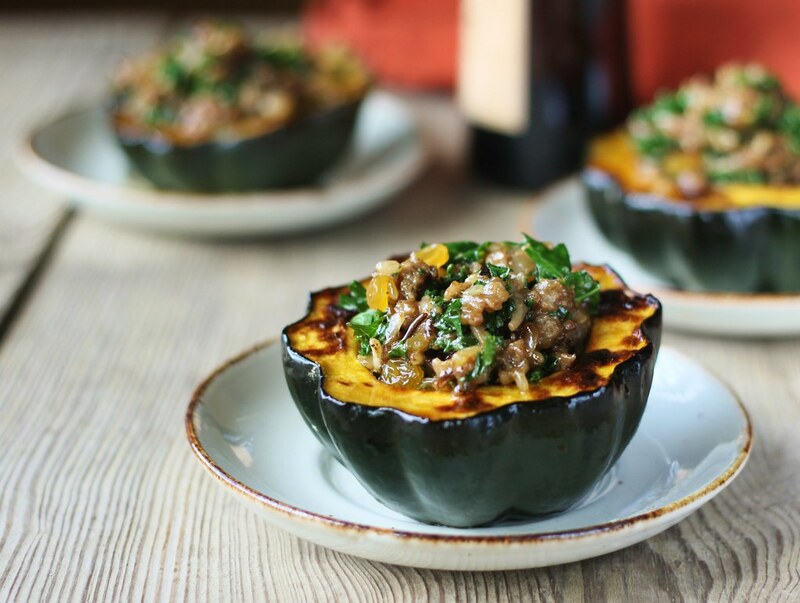 Scoop stuffing into roasted acorn squash bowls and enjoy!